The first article of my series about extracting tabular data from PDFs focused on rather simple cases; cases that allowed us to convert the PDFs to plain text documents and parse the extracted text line-per-line. We also learned from the first article that the only information that we can access in PDFs is the textual data that is distributed across the pages in the form of individual text boxes, which have properties like a position, width, height and the actual content (text). There’s usualy no information stored about rows/columns or other table-like structures. Now in the next two articles I want to focus on rather complicated documents: PDFs that have complex table structures or are even scans of documents that were processed via Optical Character Recognition (OCR). Such documents are often “messy” — someone scanned hundreds of pages and of course sometimes the pages are sloped or skewed and the margins differ. It is mostly impossible to extract structured information from such a messy data source by just converting the PDF to a plain text document as described in the previous article. Hence we must use the attributes of the OCR-procossed text boxes (such as the texts’ positions) to recognize patterns in them from which we might infer the table layout. When we use OCR, to what should we pay attention? How can we extract the text boxes and their properties from a PDF document? How can we display and inspect the text boxes? How can we straighten skewed pages? So there’s no information in the document like “this text is in row 3, column 5” of a table. All we have is the above attributes from which we might infer a cell position in a table. In a short series of blog posts I want to explain how this can be done. In this first post I will focus on the “simple cases” of data extraction from PDFs, which means cases where we can extract tabular information without the need to calculate the table cells from the individual text box positions. In the upcoming posts I will explain how to handle the harder cases of PDFs: So called “sandwich” documents, i.e. 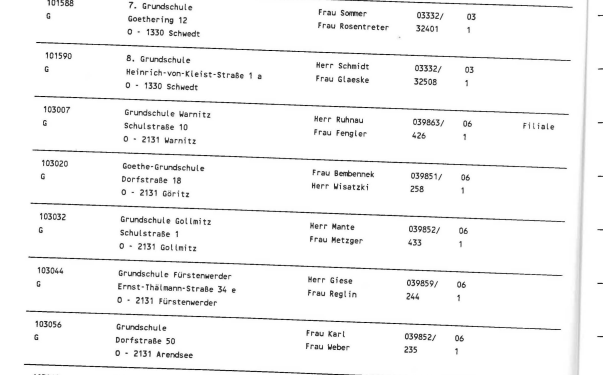 PDFs that contain the scanned pages from some document together with “hidden” text from optical character recognition (OCR) of the scanned pages.